All Images as seen for Web Design. 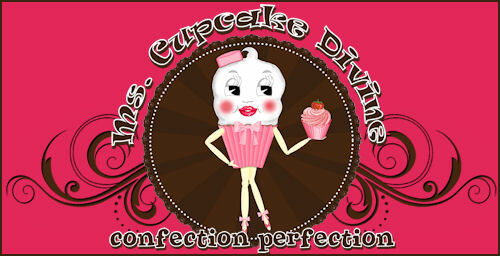 "Ms. Cupcake Divine" illustration is an original illustration that is LEGALLY copyrighted and cannot be used by anyone other than the buyer of this template package. (Registered Copyright #0030097) Any duplication or derivative work using this illustration or parts of this illustration will constitute copyright infringement and legal remedies will be pursued. Matching Logo for use in your print advertising and/or packaging. Three social network icons (Facebook, Twitter & Blog) which are animated with a mouse over effect. Animated Slide show using up to six of your own images. 1000 two sided matching business cards sent to your address. Two matching link exchange banners. Installation and set up of your web site when hosted with any of our approved hosting sites. Two Months FREE advertising with the best online shopping mall on the net - Shabby Lane Shops! Purchase of this template does not include any revisions or additions to this design. Additional design requests will incur additional charges. Purchase of this design comes with our exceptional customer service. We do not just set up your design and then desert you. After your design has been set up we will send you our step by step instructions getting you started adding text and products to your site and we will be here as you have questions along the way. Our instructions even show you how to optimize your site for the search engines - no need to hire someone else to do that for you. With our instructions you will see that if you can type an e-mail you can have your own online presence. It doesn't get any easier then this! Victoria's Shabby Cottage has web templates to please all styles. Our design concepts cover Victorian, shabby chic, romantic cottage, vintage, scrapbook, boutique and storefront illustrations, feminine and girly, or modern styles plus we are available to design something custom just for your business! We also offer matching design services such as logos, business cards, labels, book marks, hangtags, notepads, postcards, pamphlets, brochures, stationary and other printing services.